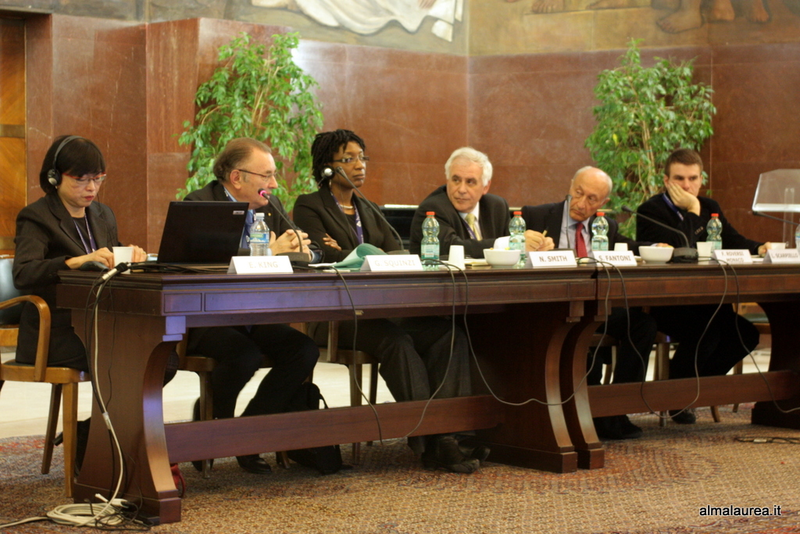 Using knowledge to redress the mismatch between graduates and the job market: this is the suggestion put forward by Nicole Smith from the Center on Education and Workforce at Georgetown University, Washington, who participated in the Conference “After the higher education degree: paths of study and work-based learning in Italy and in the international context”. “For us it is extremely important – Smith said – to understand the link between what you learn and what happens after graduation. This type of survey is, for other countries, an opportunity to learn and find ways of reducing frictional unemployment, especially in post-recession economies”. Being aware of how newly-graduated individuals enter the job market and what their and the employers’ expectations are, also helps prevent phenomena such as “brain drain”. “Every time graduates are not paid as much as they would expect to earn you have a problem of brain drain – Smith said – and the key issue is always that of creating jobs so that the most qualified workers stay”. A “knowledge society” considers young people and their destinies as a reference point for the future of each country. Do you think that the AlmaLaurea system can provide a useful contribution to enhancing the value of human capital, with special reference to young people? Do you think it could be extended to other countries, both in and outside Europe? “I think that what AlmaLaurea is doing is very important. I do not know of any other surveys that have been conducted of this nature anywhere else. In the United States, we have tried to implement the same system on a State by State basis, trying to track what happens to our students after they graduate. It is extremely important for us to understand the connectivity between the knowledge, the skills and the abilities gained in post-secondary institutions and what happens once you graduate. Surveys like AlmaLaurea’s are helpful in improving the connectivity between workforce and education. Once these tools are implemented we may be able to reduce the mismatch between the students who graduate and are not able to initially attach to workforce. This type of research is extremely important and definitely offers a great opportunity for other nations to learn from this and figure out how to decrease frictional unemployment particularly in post-recession economies”. Do you think that an improvement in the quality of the education system not followed by adequate development of the national production system may give rise to a “brain drain” of graduates? “Whenever graduates are not paid what they expect to earn there is a brain drain problem, especially if there is free movement across certain geographical areas. I can speak for the United States particularly: many States that have not been able to create the types of jobs that would facilitate their Bachelor’s degrees earning comparable wages across the system, have lost and are still losing many of their B.A.’s. For us this is a tremendous problem. I can give you examples: West Virginia has been a net losing State, has lost so many graduates that were imported by Washington DC, Maryland, Virginia… these are the States that have increased their intake of B.A. pluses. Therefore, the issue of brain drain is of paramount importance: you have to create the jobs to get your workers who are qualified to stay there”. In the light of the current global context, the barriers to access to higher education and, later, to the job market are persistently linked to gender differences and differences among generations, at least in the European setting. What about the United States? What type of actions could be undertaken to promote equal opportunities? “The persistence of opportunities from one generation to the other is something we are particularly concerned about. In the United States, in particular, part of the problem has to do with racial issues as well as with the social and economic level. For this reason, intergenerational mobility tends to be cyclical: if your parents do not have a degree, you have even less possibilities to get one. However, some policies are being implemented starting from high school, because the problem in the U.S. is completing high school and accomplishing an effective transition to post-secondary education. What we are trying to do is improve the institutions, increase the rate of high-school leavers who continue studying at university, allow students from the lower social and economic classes to have access to higher education while they are working, for example through an internship”. Otherwise, if you come from a low-income household and have no possibility of earning some money you have less chance of getting access to post-secondary education. In the U.S. we are moving towards a system of short-term educational certificates: you get your certificate within a period of one year, you become part of the workforce, you are paid for what you actually do and from that point you start building your professional career”.